The result of the referendum is now known, with 66.4% voting Yes and 33.6% voting No. But pollsters have also obtained information behind those figures. 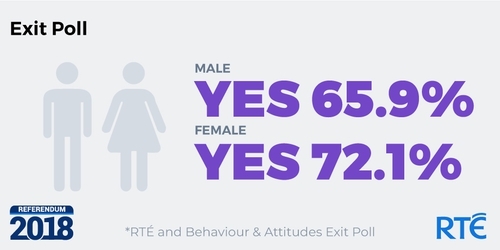 An exit poll was conducted by RTÉ in conjunction with a number of Irish universities and was carried out by Behaviour and Attitudes. The results were compiled from interviews with more than 3,800 people at 175 polling stations across the country immediately after they voted. The margin of error was 1.6%. The exit poll showed that the personal stories or experiences of women had a strong influence on how they voted. Here are eight insights from that exit poll. 72% of women and 65% of men voted for repeal of the Eighth Amendment, the exit poll suggested. Some commented that there is no urban, rural divide anymore. The exit poll indicated that urban and rural areas alike showed support for Yes. The Yes vote was highest among younger voters and all but one age category voted Yes, the exit poll found. The only age cohort to vote No were those 65 and over, the exit poll suggested. The exit poll suggested that there were no major differences in how the regions voted. Every region voted Yes. Most voters indicated that women's right to choose followed by the risk to the life or health of a woman were important. The exit poll suggested that the personal stories or experiences of women had a strong influence on how the electorate voted. The vast majority of voters did not change their minds on how they planned to vote during the campaign, the exit poll suggested. The RTÉ/B&A exit poll was organised in cooperation with political scientists based at University College Dublin, University College Cork, Dublin City University, and KU Leuven.